When UC Davis Chancellor Linda Katehi arrived on campus from the University of Illinois just over two years ago, the biggest controversy was over her salary. She would be paid $400,000, an $85,000 increase over the previous chancellor. Katehi can only wish for those days. She's now embroiled in a nationally watched firestorm over the campus police department's use of pepper spray on student protesters last Friday. Video of that incident quickly went viral online; a reminder of the power of social media. UC President Mark Yudof said he was "appalled" at the pictures, which led Monday to the placing of the campus police chief on administrative leave. Two other officers had already been placed on leave. 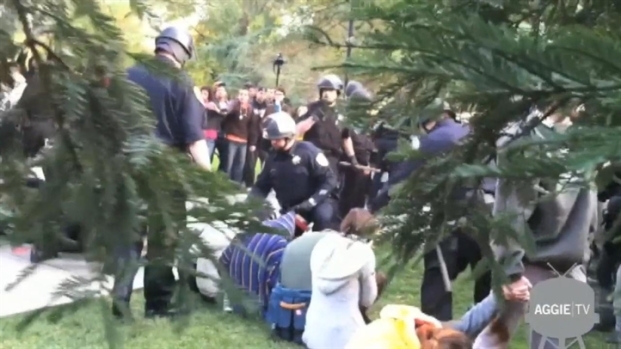 The UC Davis campus police chief has been placed on leave following the incident that was caught on tape. It's also led to demands from some students and faculty for Katehi's resignation. She said Monday on ABC that she would not, adding that "I really feel confident at this point the university needs me." Katehi is setting up a panel to investigate what happened Friday to students during the Occupy Davis protest on the campus quad. But that's unlikely to cool hot tempers, even as more students massed for a rally Monday. Katehi spoke briefly at the rally, apologizing to students for the incident. Davis is no Berkeley. This isn't the 1960's. This isn't just an expression of support for the Occupy movement. What's happening on this normally quiet campus reflects a growing conflict about how police should respond to non-violent protests, given confrontations on other campuses. It also reflects simmering unrest over a series of fee hikes and campus spending cutbacks passed by the University of California to address funding shortages from the state. Katehi, whose background is in electrical engineering, finds herself navigating a social and political firestorm unlike anything she's encountered in a campus lab or boardroom. There's no indication that her job is in jeopardy yet. But what's happening at Davis is a reminder of the volatility of a misstep that brings the world to your door; with the clash between the need for campus safety and the rights of protesters to peacefully gather.